I'm way, way behind on my cookbook reviews, so I'll try to post a bunch of fairly short reviews in order to cover a lot of books that I want to mention. First out, a bunch of books that are especially perfect for summer. 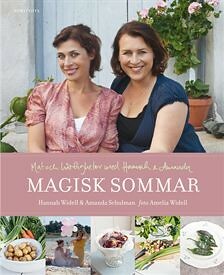 Magisk sommar ("Magical Summer") by sisters Hannah Widell and Amanda Schulman. These sisters are fairly well known in Sweden, albeit for their various jobs in the media and not for their cooking. I don't really mind non-chef-y cookbooks, and this one is surprisingly nice. A third sister - Amelia Widell - has taken all the photos, and they're very good too. The book is based on their summer vacations on the Swedish island Gotland, where they all have summer houses. It has a little bit of everything - baking projects for rainy days, barbecue, yummy desserts, picknick food... The recipes are short and approachable, and don't shy away from shortcuts. And I really need to try princess cake with meringue cake layers - why didn't I think of that? 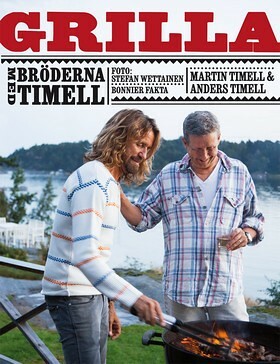 Grilla med bröderna Timell ("Grilling with the Timell brothers") is another book by a famous pair of siblings, brothers this time. Martin and Anders are both well known in Sweden for various TV- and radio shows. Martin mostly as a fix-it kind of guy, Anders seems more of a party person and has a daily morning radio show. This book is about their summers, on ANOTHER Swedish island. Popular theme. And again, it's not a bad book. It's rather nice, actually. The recipes are easy to follow, but seems to yield fairly impressive food, definitely something for when you have guests over. 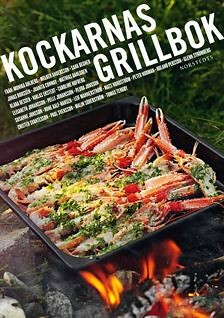 Kockarnas grillbok ("the chefs grilling book") has a lot of recipes from more or less prominent Swedish chefs, and many of them look great. However, the book is completely unstructured which makes it a little hard to use. It's nice to look through but as there are no chapters at all, I don't find it very useful.